It's been a while since our last contest, and with Star Wars Days coming up we thought it a good time to get the ball rolling again. The challenge is pretty simple, so to make it interesting we've split it into two categories - basically two smaller contests run simultaneously and you're welcome to enter either or both. Expand the post or check out the forum thread for full details, deadlines, and prizes. The first challenge is Microfighters - those little ride-on ships Lego has come out with in recent years. Sort of chibi-fied looking with minifig pilots. 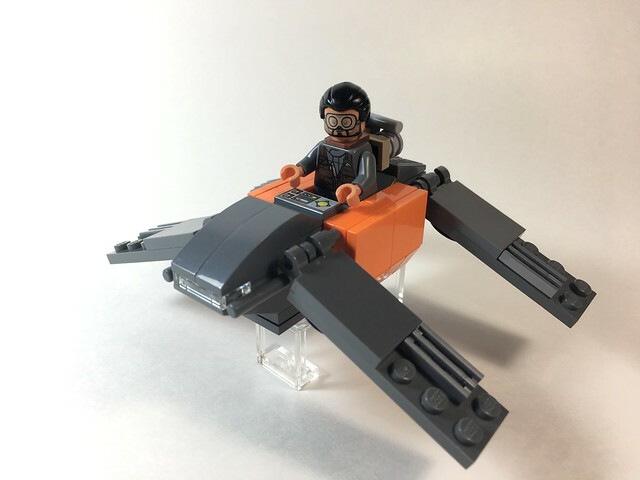 Pick a vehicle from any of the mainline films or TV series, so long as it has a pilot and hasn't been made into an official microfighter set already, and build your own version (complete with minifig pilot). The second challenge is Midi-scale Ships. Check out official sets 8099 and 7778 for the general idea and this hangar scene by Sparkart from a few years ago. Bigger than microscale but smaller than system, without pilots and the stylized aesthetic of Microfighters. A nice way to tackle capital ships at a more manageable size. Midi isn't so much a solidly defined scale as it is a general size of the finished product. If you're worried about missing the mark just keep this in mind: if it won't fit in a shoe box you're building too big, and if it could make a good polybag set you're not quite there yet. No unofficial or modified parts allowed. No pre-existing or virtual models. No changes allowed after the deadline. Do not base your models on any official sets. Post your entry (or entries) in the contest thread before the deadline, which is 11:59PM PDT Tuesday May 23rd 2017. That’s four weeks from now. You're allowed one photo per submission, and one submission per category. You do not need to post them at the same time, and you can link to additional photos or a gallery if you wish. Just do not embed them in the post for clarity sake. You must use Flickr to host your entry pictures because we rely on the built in image resizing feature. If you do not have an account you can sign up for free, or ask a friend with a Flickr account to host them for you. Once uploaded you will need to embed your photos in the forum. Here’s a quick visual guide on how to copy the correct code for the forum. Follow that, then paste it into your reply and do not add any more forum tags to the Flickr code. It works as is. Preview your post to verify that it worked before submitting it. If it didn’t work, PM Solo. Please do not post any non-entry photos to the contest thread, and remove any embedded images if you quote a submission to avoid cluttering the thread. You must have a forum account to enter. Entries by proxy will be not be allowed. Photography note: be sure to submit the best pictures possible. Color and contrast correction is recommended if necessary. The only other image enhancement allowed is replacing the background with either a solid color or simple gradient. Your photos cannot be altered in any other way. For example; no composite views, special effects, text, graphics, or scenery will be permitted. Remember, the contest is about the models – not your image manipulation prowess. 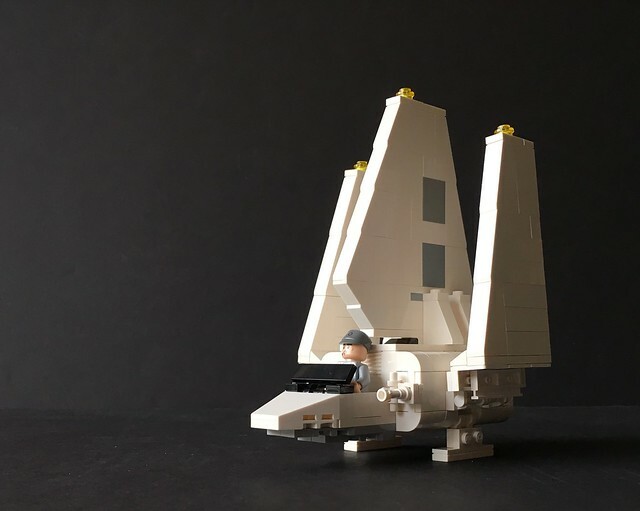 If you wind up submitting your model to Lego Ideas after the poll has ended, you’re obviously welcome to further enhance your photos however you wish. Winners will be determined in a pair of week long polls following the deadline. The winner of the Microfighters category will receive four sets: the latest wave of Microfigthters. The winner of the Midi-scale category will receive a 7778 Midi-scale Millennium Falcon. Great! I was waiting for such a contest! Clarification, please: "hasn't been made into an official set already" refers specifically to Lego's Microfighter sets? E.g. T-16 Skyhopper, Venator or even Death Star would be ok. They do already exist as official sets but not as Microfighter. I also wanted clarification of the above and this: microfighter only applies to those chibi, piloted ships? Not a build like the planets? What if what we build doesn't have a pilot, or we're not really sure what kind of pilot it would have? I'm referring to Clone War droid ships & the like, or like the T-16 or T-35 landspeeder in ANH. Also, no brick built animals like tauntauns, bantha or dewbacks? I'm not sure I will take part in this contest, but I look forward to seeing the builds, these rules are such that there might be some really amazing builds. I updated that line for clarity - yes it applies to microfighter sets specifically. We just don't want to rehash what Lego has done. As for ambiguously piloted ships: Lego made a T-16 pilot and Luke generally is the one driving his landspeeder around, but as long as the pilot makes sense for the vehicle then you can switch it up. 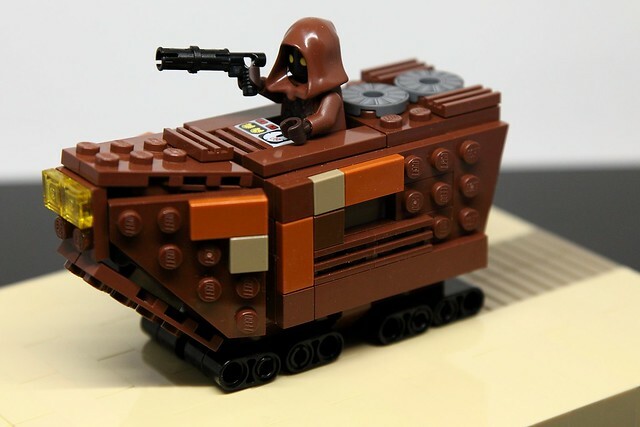 Droid ships should have a droid pilot like Lego did with the system gunship 75042. Not strictly accurate, but it makes it fit the mold of a ride-on microfighter. Aminals [sic]...awwww...adorabilty alone would have made those top-vote getters. I'm still going to make a baby Dewback mount for a Sandtrooper minifigure for Legoland Star Wars Days. Either that or a Dewback for a Brickheadz Sandtrooper. Oh, Microfighter-Brickheadz! On second thought, that kind of mashup would be pretty large, and defeat the character-centric appeal of a Brickheadz, no? Want your own set of MST3K Robots? Visit LEGO Ideas! Does someone have a handy list of the official microfighter sets? 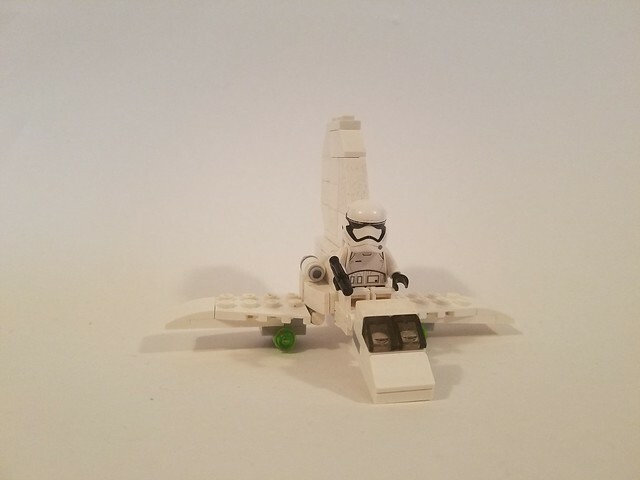 Ok, I'll start this contest with my entry for the Micro-fighter category, I hope. 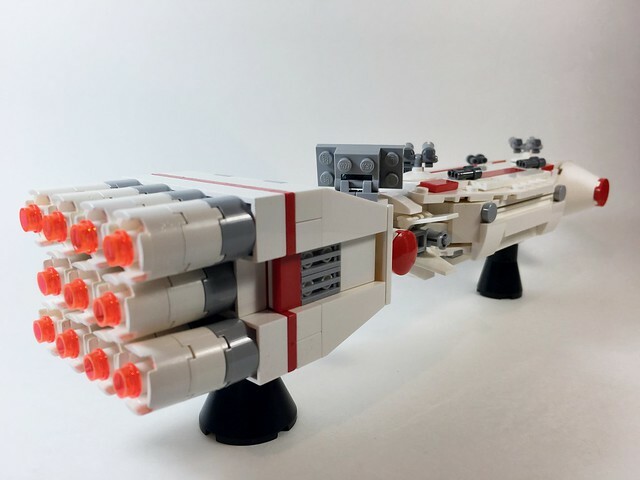 I also turned it into a Midi scale version, if the judges feel that it looks too big for a micro fighter. A Render image is shown here, but I can retake the photo if the judges would prefer. 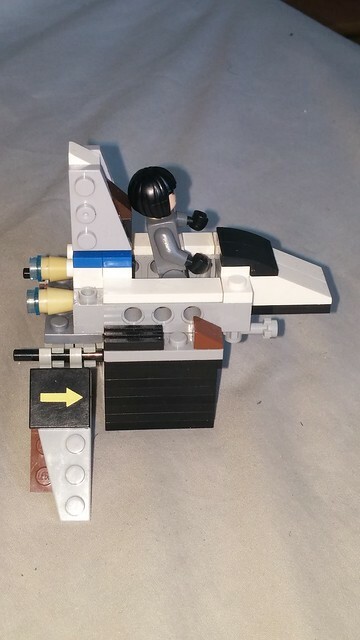 Here's my entry for the Microfighter category- Rogue One Imperial Cargo Shuttle with pilot Bodhi Rook. Thanks for hosting this contest FBTB, and good luck to all entrants! I feel this should also apply to Darth Vaders Tie Advanced as it was micro'd in both sets #75159 and 10188, as well as the comic-con exclusives that "are" still recognized Lego sets which include the E-Wing, Lukes Land Speeder, Sith Infiltrator, and the Slave I. You guys are correct. Those micros are still official even though they weren't part of the line, so those ships are off limits. Vader's TIE from the Death Star wasnt really a microfighter though, was it? the cockpit was fully enclosed, unlike MicroFighters. Its on a stack of CMF stands for the flight configuration with the wings extended. I did an earlier version using Flags for the wings, but i think i like the larger size better. Last edited by Shadowclaw on Sun May 07, 2017 11:06 am, edited 1 time in total. Last edited by Shadowclaw on Sun May 07, 2017 11:05 am, edited 1 time in total.